We will compare ASP.NET and Node.js for backend programming. Koa.js no longer uses co-routines, it has switched to Babel's async/await. yield and await are used almost in the same way, so I see no point to rewrite the examples. To meet the deadline this article was made in haste based on googling, basic experimentation and superficial coding experience. This is a sketch with mistakes and subjective claims, not a thorough guide. Double check before any serious usage. To compare two distinct concepts we need an aim. We can compare apples to oranges only if we know the aim, e.g. our aim may be to figure out which fruit is less harmful for nutrition of small children, which is better for public speakers (produces less harm to the throat) and so on. Purpose described as 'backend programming' is very broad, within it there are tasks which are better suited for Node.js as well as there are such for ASP.NET. Simplicity of the code and deployment. You may also compare Node.js and Node.js harmony, ASP.NET 4.5 and ASP.NET 5 Beta. The reason for comparing unstable brunches is that Microsoft is striving to adopt strong sides of Node.js in their latest ASP.NET so it closely resembles and mimics Node.js. ASP.NET 5 Beta is a striking competitor within .NET and asynchronous programming though it is not production ready yet. Framework ASP.NET 4.5 holds only core functionality and hardly could be compared to Node.js, instead we will be comparing Node.js with ASP.NET 4.5/Katana or Web API 2. Katana is a layer of abstraction between .NET web application and the underlying server, it offers low-level handling of requests using middlewares (like Node.js). ...an ideal platform for building RESTful applications. We consider Web API because it is low-level as well. In some cases we will consider ASP.NET MVC. But the current stable ASP.NET MVC 5 (framework) and Node.js (runtime environment) are so different that it's hard to compare them. ASP.NET is a web application framework by Microsoft. ASP.NET Web Pages, ASP.NET Web Forms, ASP.NET MVC, etc. For example, ASP.NET includes such common functionality as facilities for managing requests, handling sessions and a login security model based around membership. These frameworks has different goals, may be used together and will be merged into ASP.NET vNext. The following diagrams present ASP.NET architecture in relation to other frameworks. ASP.NET is a sophisticated engine using Managed Code for front to back processing of Web Requests. ASP.NET is a request processing engine. It takes an incoming request and passes it through its internal pipeline to an end point where you as a developer can attach code to process that request. This engine is actually completely separated from HTTP or the Web Server. Building web applications in pure ASP.NET without MVC, Web API or other overhead seems possible but it's certainly not a common case and I didn't find any documents explaining when it's needed and how to achieve it. So in this article we will assume that at least one of ASP.NET overhead frameworks is used, preferably ASP.NET MVC. The main difference between Node.js and ASP.NET frameworks is their processing models. Node.js dictates asynchronous processing style while ASP.NET offers programmer a choice. Node.js was build around asynchronous model from ground up while async keyword appeared in ASP.NET MVC 4. Figures below demonstrate differences between synchronous and asynchronous models for a web application. As shown Node.js uses one thread for handling requests and many threads (actually, not true threads) to provide asynchronous non-blocking IO (e.g., to the database or to other REST server). Fewer threads means fewer memory for stack allocation and more economic usage of the CPU. The diagram above shows multi threaded server that may be found, e.g., in Java. In this model the server spawns new thread for handling each request which sleeps on blocking IO operations consuming CPU and memory resources. So how exactly does ASP.NET work? ASP.NET doesn't use one thread but instead uses restricted by number of concurrent requests pool of threads and queues requests to it. Threads may be terminated on asynchronous operations like in Node.js. However, ASP.NET processing model is more prone to context switching which implies additional CPU costs. More than that as ASP.NET and .NET were not designed with asynchronous programming in mind some libraries may still offer no support for it or offer "fake asynchrony", this makes .NET freedom of async choice quite restricted. Though this argument fades with time. ASP.NET uses C# as its primary language. C# has classical inheritance model, EcmaScript6 classes offer new syntax for the same prototypical inheritance (which has its benefits and quirks over classical). C# exerts async and await keywords. Using callbacks. This way your code becomes hard to read, and control flow is hardened. See Node.js Pyramid of Doom or Callback Hell for examples. This approach appeared the first. yield keyword, co-routines, generators and Promises eliminate your code from deep nested callbacks and makes it easier to read. This approach is demonstrated by Koa.js web framework. await and async keywords are part of experimental EcmaScript7 standard and may be used today with transpilers like Babel. This syntax constructs make your code more clear for those not introduced to generators. So, C# asynchronous model is more clear. It compels you to write your code in asynchronous manner, so most libraries support asynchronous model. It implies fewer context switches as stated by some sources. The following set of examples demonstrates if-else control flow implemented in asynchronous manner. 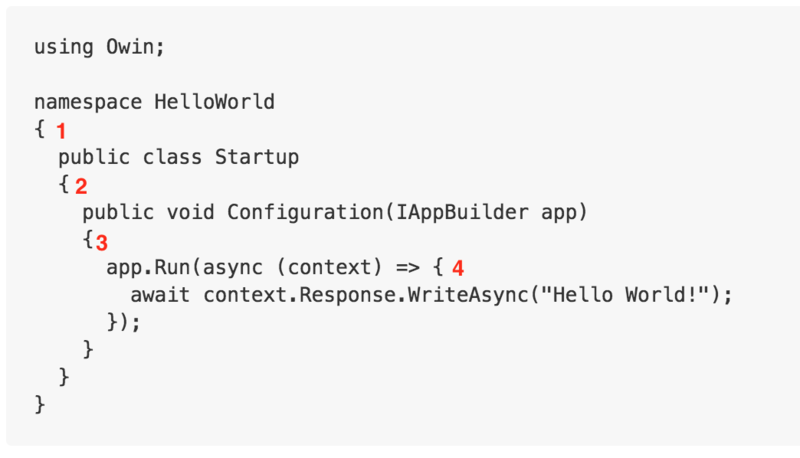 The purpose of these examples is to get the feeling of asynchronous programming models in Node.js. First approach, keep state in object passable between callbacks. Example inspired by Express.js and Passport.js. authenticateMiddleware keeps its state somewhere in req object and checks it with req.isAuthenticated method. The same approach, but with Koa.js, the state is kept in this context object. It may be not idiomatic as it is written by non-experienced programmer. Second approach, throw exception and process it in the next middleware. In these examples we will compare different asynchronous models of Node.js and ASP.NET applied to one given task. Popular HackerNews site has a json api. The task is to retrieve top story title from HN API. The development may be carried out in any text editor, terminal or Visual Studio, without IIS as an option. Now the same trick but with ASP.NET 4.5 and Katana. This time all development is done in the latest Visual Studio which runs nuget restore, builds project and deploys it on the server. Corresponding bare bone Node.js server script. Notice the boilerplate code and deep nested callbacks (callback hell). // Biolerplate code to produce GET requests. To get rid of boilerplate code you can use either request or visionmedia superagent. To counter callback hell let's use co@tj library. To assess simplicity let's consider hello world examples of Node.js, ASP.NET 5 Beta and ASP.NET 4.5/Katana. app.listen(3000); // Deploy a server on port 3000. Two files for project and native server coming within Node.js. Can't be simpler. Generators as a way to counter callback hell, more tricky. Things get more complicated with yields, Promises and co@tj in real world, recall HN API example. Now let's look at some corresponding examples for ASP.NET 5 Beta. All examples are taken from https://github.com/aspnet/home and modified for comparison. Commands I've used to run HelloWeb sample. Almost as easy as with Node.js. Almost the same but to run this code you will need Visual Studio with some web server. Installing (restoring) and building from terminal is possible, deploying is tricky. For more examples of ASP.NET 4.5 you may consider Web API 2 in Code/hello-world-asp.net-web-api-2 folder. Developing for ASP.NET 4.5 is harder because you depend on Visual Studio/NuGet which don't always work perfectly (e.g., NuGet may fail to resolve dependencies). Learnability is defined by how easy it is for a newcomer to pick up the language. Node.js is "close to the metal". It offers fewer and thinner abstractions. So you don't have to configure their overwhelming number of parameters, but instead you are faced with writing the code out of multitude small components. This approach gives you flexibility of tailoring the code up to the solution. It may be expected that in place of configuration the programmer is supposed to write much more boilerplate code. It's not the case with Node.js as it offers all needed facilities from native or third party libraries at the same time not compelling you to use bloated abstractions. Node.js programmer is free in choice of programming libraries, has a uniform way of combining them as middlewares, may easily divert from MVC in favor of any other architectural pattern and controls options that may be concealed by abstractions in other frameworks. Node.js imposes only a few conventions: asynchronous programming, most servers and frameworks use middlewares (Express.js, Koa.js). Like Node.js ASP.NET 5 also proposes middlewares and low-level "close to the metal" control. But on the other hand ASP.NET MVC 5 or Web API 2 (both ASP.NET 4.5) are quite different. They offer abstractions but don't imply much configuration or boilerplate code. Instead they leverage convection other configuration principle. It means it has conventions which are when followed make your code concise and readable. E.g. there is a predefined folder structure for every MVC project to follow, naming conventions for controllers, etc. So, yes, ASP.NET imposes upon you its view of things. The problem is that if you want to divert from conventions then you are deprived of all this automatic out-of-the-box behavior and faced with manual configuration. To simply get rid of or change Content-Type in Web API 2 requires much work, relying on third party libraries or writing own Formatter class. Now, the question is whether these conventions are good and apt for your tasks, will they make you happy with your task so you don't have to configure everything from scratch. ASP.NET MVC 5 exerts many conventions with which everything works out of the box, but tailoring code for your needs requires more configuration. ASP.NET MVC 5 offers many abstractions which may be great for large applications but seem bloated for simple tasks. Also programmer looses sense of control when everything is automated behind abstractions. Node.js and ASP.NET 5 impose very few conventions but offer great flexibility. Certainly there are tasks where ASP.NET outperforms Node.js and there are tasks where ASP.NET looses. To take advantage of multi core system Node.js must be clustered. To outperform with IO-expensive tasks ASP.NET must use async/await keywords. Here is a chart benchmarking ASP.NET Web API and Node.js for asynchronously reading POST body, 2012, source. Chart below compares performance of Node.js and ASP.NET MVC 4 for asynchronously reading json file from filesystem, 2012, source. The explanation why asynchronous Node.js is faster than asynchronous ASP.NET may be that it uses fewer context switches. Node.js is created for fast request handling without heavy computations. In all tasks requiring heavy computations Node.js will certainly loose to ASP.NET. In cases where Node.js is not clustered or doesn't take advantage of asynchronousity it looses to ASP.NET, e.g. see this. There are several implementations of .NET virtual machine, Mono is one of them. By ecosystem I mean the availability of third party packages and community support. My choice may be highly subjective but I believe Node.js is cheaper in general. 2014: Relative to .NET, there aren’t as many Node.js developers in the current tech scene that are capable and competent. In most cases C# wins in readability though its use of abstractions and language features may make your code obscure. It got even harder because .NET ended up with 3-4 different patterns for doing async. .NET 4.5 is trying to go back and retrofit the .NET framework to have an opinionated model around async IO, but it may be a while until the frameworks you care about actually support it. Reliability is defined by how robust your program to failures in input, runtime exceptions, programming errors, etc. Things get more complicated when dealing with error handling in asynchronous code. It's more robust to use generators with yield wrapped in try/catch instead of error callbacks in Node.js. Generality of code is defined by whether it may be applied to vast majority of use cases, e.g., different types of inputs. However, V8 has hidden types created internally for objects at runtime; objects with the same hidden class can then use the same optimized generated code. ...operations that accept multiple types will be less performant. Currently Node.js ecosystem is being split between callback and Promises approaches to asynchronous programming making old libraries cumbersome to use but on the other hand ASP.NET is split in addition between synchronous and non-synchronous libraries (which is really not a big problem, in my humble opinion, as most use cases are being covered). Except some issues Node.js works great on all major platforms. ASP.NET is ported partially, e.g. MVC 4 on Mono lacks support for async features. The forthcoming ASP.NET 5 is expected to cover all major platforms. Definitely, currently Node.js wins in portability. Orthogonality is defined by how many programming concepts and their combinations you have to use to reach your goal. It is related to the language used, to the ecosystem involved and cohesion/coupling. It seems to me Node.js has looser coupling and that's why it wins in orthogonality. ...maintainability is inversely proportional to the amount of time it takes a developer to make a change and the risk that change will break something. Let's put there are Code Efficiency and Programmer Efficiency. The goal of code efficiency is to reduce resource consumption and completion time as much as possible with minimum risk to the business or operating environment. So, Code Efficiency is related to performance that is discussed in a corresponding chapter. We will assume that Programmer Efficiency is defined by how easy it is for the programmer to implement some new feature for a project. I believe the crucial ground for efficiency is ecosystem and subjectively Node.js is better here. Currently, by default v8 has a memory limit of 512mb on 32-bit systems, and 1gb on 64-bit systems. The limit can be raised by setting --max_old_space_size to a maximum of ~1024 (~1 GiB) (32-bit) and ~1741 (~1.7GiB) (64-bit), but it is recommended that you split your single process into several workers if you are hitting memory limits. With ASP.NET there are statements that memory management becomes difficult when you reach a 2GB threshold on 64x machine but sources are scarce. Node.js uses one CPU thread and to make use of multi threaded platform you have to engage clustering. ASP.NET/IIS makes use of multiple threads out of the box with Thread Pool. If you want to spawn new processes and engage concurrent processing then C# is a powerful language for it while in Node.js you have to resort to clustering with IPC again (and don't even ask about synchronization or atomics). Parallel execution in libraries like co and async are "about kicking-off I/O tasks in parallel, not about parallel execution of code". Definitely Node.js has its advantages over ASP.NET 4.5, that's why it has conquered such popularity. While ASP.NET 5 Beta is promising to catch up it is not production ready yet. All frameworks have its fortes and shortcomings to put up with -- it's a matter of preference which one to choose. Here is a final table to help you pick the right direction. Flexibility -- how easy it is to tailor framework to your specific needs. IO performance Wins -- ?? Learnability Easy to start, not mature Mature, but abstract ?? Flexibility Wins MVC, Web API are hard to tailor ?? ASP.NET MVC embraces Single Responsibility Principle and I'm pretty sure it embraces the whole SOLID set of principles of OOP. ...each of the components in the MVC framework is fairly small and self contained, with single responsibilities. This means that due to their small size you have building blocks that are easier to understand. It also means that you can replace or even alter the building blocks if they don't suit your needs. When using named argument specification, the order can be any. C# code doesn't contain error handling. Great love for big functions. I guess there are a lot of confusion but I don't have enough pleasure to search them. JS/Node.js with typescript is better, strongly typed. Monkey patching actually make your code more maintainable. Cross concerns are separated and encourage more AOP development. Monkey patching is important for decorating/extending services that would otherwise be a sealed class in .net. // I decorate protractor's browser.get to inject my helper methods into every page. For $firebaseObject I decorate $loaded, $save to attach to .catch and use my own notifyService. These approaches are powerful that would not be possible with a .net sealed class. AOP in C# is possible with dependency injection containers and proxies, however, when compared with JS it really shows how cumbersome the framework makes it. @alexey-sh Thank you for your remark. Which language is better is a subjective question, consider paying attention to more factual things: JS has more quirks, C# is more verbose and offers type safety without transpilers, etc. You are welcome to suggest more. Being both a C# and NodeJS developer, what i find to be the biggest difference is in the code architecture. It is much more difficult to design and refactor C# SOA/microservices as opposed to NodeJS. It is also more difficult to scale a ASP.net application horizontally (although web api makes this much easier). Also, i'm not sure if they are being purposefully misleading about the asynchronous nature of NodeJS vs ASP.net, nodejs was built with this in mind whilst ASP.net was not. It is inherently easier to teach someone how to code asynchronously with NodeJS, as opposed to C#. In fact, i would argue NodeJS is easier to teach someone, and have them productive in a shorter period of time, than C#. Coming into a NodeJS application, using microservices, i can become productive on a micro scale very quickly. On an ASP.net application, there is so much tight coupling that it affects the lead time for every piece of code drastically. In my personal opinion, i believe that microsoft is moving in the correct direction using web api and typescript (angular 2), as opposed to the classic ASP.net MVC structure. I recommend you look at this research of development company The best Node.js framework for your project: Express.js, Koa.js or Sails.js I think that it worth reading. Can u please what tool did u use to monitor node.js resources? I'd like to add, that the most important thing in real world is not only the performance a framework provides, but also its extensibility is much more significant matter, since servers' configuration grow rapidly, while, their costs are reducing. I prefer to get advantages of open source ecosystem, and use something like Docker, Redis, Mongo easier. I know they are available for windows, but we must accept the fact that they rise from open-source communities. Since this has been written long ago and lots has been changed since, would you be able to refine the article to current technologies, such as ASP.NET Core etc.? Please revise the document to compare the latest .net core 2.1 with latest nodeJS.